Saturday was quite the day for little Winthrop, population 6,000. There was a craft fair at the grade school—we plan on having a table there next year—various other craft fairs around town, and a pie sale at the library. Lots of people were out and about, and there was definitely a festive air in town. However, the prime event was the holiday parade, and my plan was to walk with other trustees and various library friends. We always have big bags of candy, which we haul in a little red wagon. I must admit, I love marching down the main street and throwing candy to the children, who scramble eagerly to get the goodies. Line-up was at 2:30, but because of my creaky knees, Clif dropped me off at 3:00 so I wouldn’t have to stand as long. 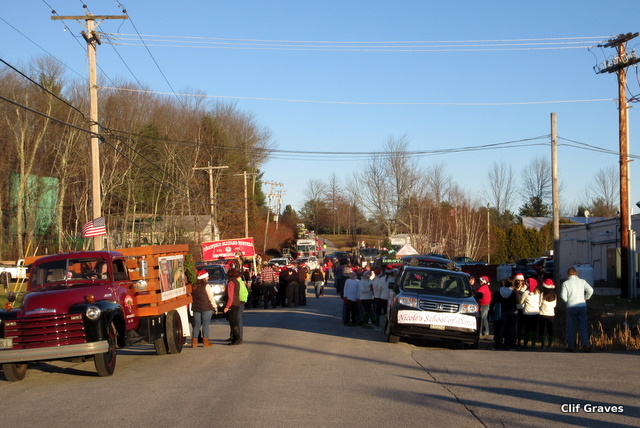 We parked at Rite Aid, and all the floats and organizations seemed to be lined up along the road that went by the store. We looked up and down the line but didn’t see the library’s banner or the crew. He left, and I found a rock to sit on not too far from the beginning of the parade, where the veterans waited with their flags. I watched the dancing girls in a local dance school as they practiced their dances. 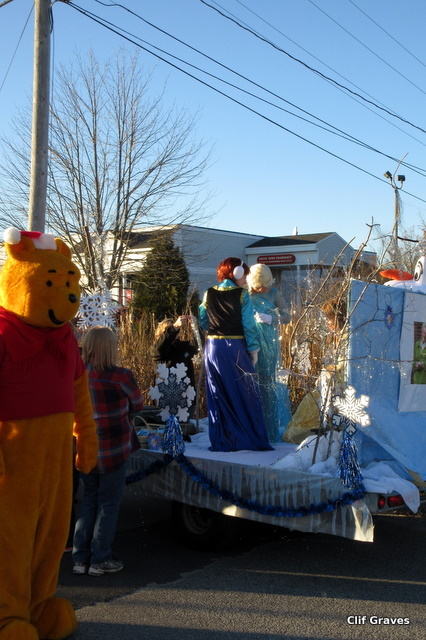 Winnie-the-Pooh bounded up and down the road, and the lovely princesses from Frozen waited patiently. The parade started at 3:30, and it slowly moved forward. I looked for the library banner but didn’t see it. Margy, a friend, stopped to chat, and she hadn’t seen the library’s banner either. 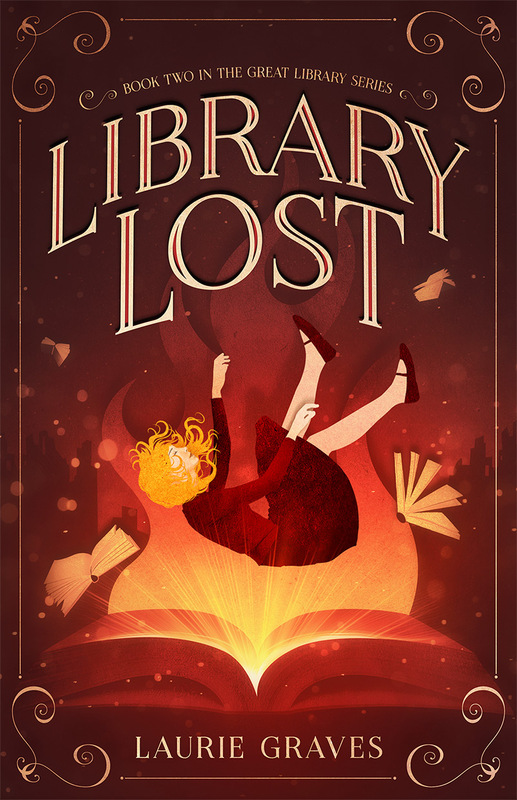 When the last of the floats and the marchers had passed, and it was time for the ambulances and fire trucks, I knew that I had missed the library contingency, but how? I had watched everyone pass. Or so I thought. Well, it seemed I would have to march down the long hill into town, but I would not be part of the parade, and I wouldn’t have any candy to throw. “Penance for my sins,” I thought as I hustled down the hill as fast as my stiff knees would allow. When I got to the bottom of the hill and spotted two of the trustees, Mary Jane and Liz, returning to their car, I found out what had happened. “We’re so sorry you missed us,” Liz said. Me, too! From where I was sitting, I had not been able to see the bank or the library banner. Ah, well. Clif got some decent pictures, and after the parade, we went over to Mary Jane’s house where we had her fabulous baked ziti—a recipe from the incomparable America’s Test Kitchen—garlic bread, salad, and good conversation. Next year, I will be sure to check the bank’s parking lot. (I’ll also bring my cell phone, which I had left in the car.) 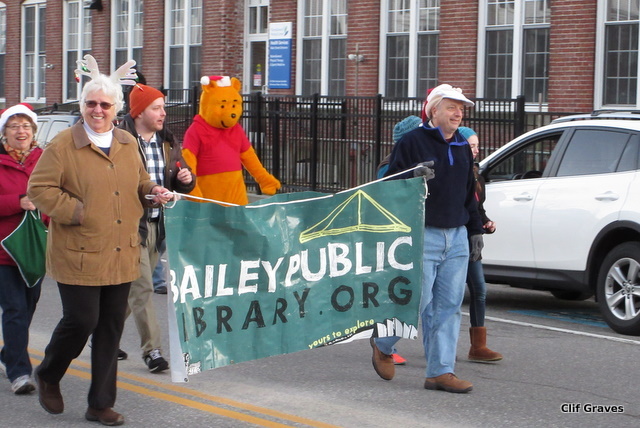 After all, it would be very hard to miss, two years in a row, marching with the library banner and throwing candy. 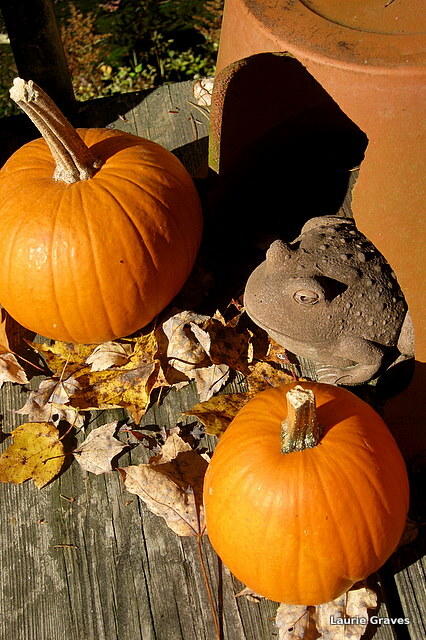 Of Ghosties and Ghoulies and…Halloween Frogs! One year on a fine Halloween, Clif rigged up speakers that blared spooky music in the woods. He also hung up “ghosts” in the trees, and they swayed back and forth in the breezy night. This was certainly a big hit with the trick-or-treaters. As a child, I absolutely adored Halloween. Few parents made their children costumes, at least in the country village I lived in. We mostly had off-the-rack costumes that came with those plastics masks that made a child’s face sweaty even on the chilliest night. Never mind! It was still a magical night. Off we would go with our little plastic pumpkins—the more ambitious trick-or-treaters carried pillow cases. Our village was so safe that we were allowed to go alone, with younger brothers and sisters and tow. We prowled the dark streets, stopping at every lighted house, and indeed nearly every house was lighted for us. Once in a while we would get the dreaded box of raisins, but mostly the adults understood that what we wanted was candy, and candy is what they gave us. After the trading, I would have a glorious stash of candy, which I kept in my bedroom, where I could dip into it whenever I wanted without having to ask permission. Such delicious freedom, and it only came once a year. Well, no more trick-or-treating, no more trick-or-treaters. 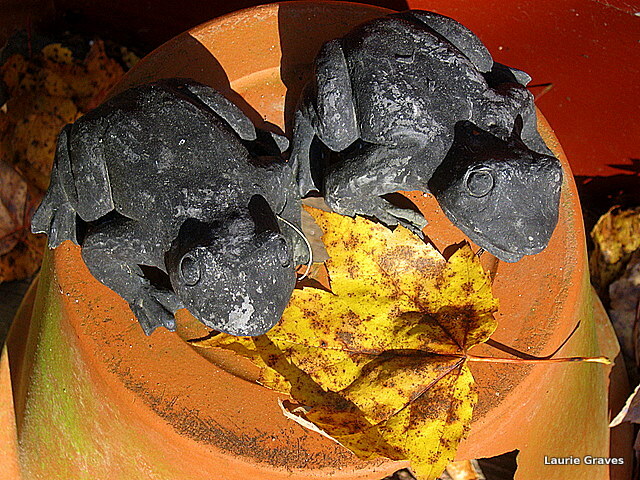 But we do have a few Halloween frogs to cheer us up. I’ve collected them from my gardens and have arrayed them on the porch along with leaves and little pumpkins. A happy halloween to all! If you are lucky enough to have little ghosties and ghoulies in your life, then I hope they receive many sweet treats. 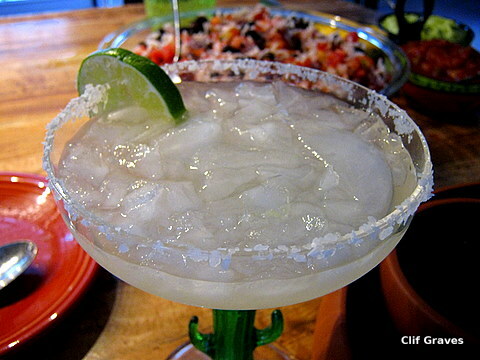 Last Saturday, our friends Dawna and Jim invited us over for dinner, where we deliciously jump-started spring and summer by drinking Dawna’s homemade margaritas. (Hers are the best!) We also had chicken tacos and a tasty rice dish. What a way to celebrate the end of March and the beginning of what we hope will finally be spring. Happy as a clam at high tide. This seems like a rather ubiquitous expression that might be said by anyone who lives in a coastal state. Nevertheless, Clif and I grew up hearing it quite a lot. A few logs short of a cord. Around this time of year, that’s pretty much the way most Mainers feel, but usually it refers to people who aren’t clever. Numb as a hake. This tells you how Mainers feel about hake. The whole of it, rather than all of it. Why we say it this way, I don’t know, but I catch myself using this expression all the time. Then, of course, there is the way we say or don’t say our Rs, and Clif and I are guilty as charged. We drop them, we add them, and most of the time we don’t even realize we’re doing this. When my daughters went to college, they both were ribbed about the way they pronounced drawing. I know. It only has one R, but we Mainers pronounce it with two Rs—Drawring. Somehow, teasing be damned, that word just doesn’t sound right to us without the second R.
We add Rs. I often refer to my friend Dawna as Dawner. We drop Rs in Mainer so that it sounds like Mainah. Or, it works like a chahm rather than a charm. I realize most people don’t speak this way, and on Public Radio, people mostly say their Rs the way they should. But every once in a while someone from New England is interviewed, and he or she drops and adds those Rs just the way it is done in Maine. And when I hear this, it always warms—or rather wahms— my heart. Dee again expressed amazement. Now, you’d think this country girl would know about grocery cart snooping in a small town, but she left Winthrop when she was eighteen, and the only grocery shopping she’s done has been in Manhattan and Brooklyn, where apparently people don’t scope out the groceries in other shoppers’ carts. On Monday, the day after the Academy Awards, I went grocery shopping for real, and my point was proved. We were low on flour, so I hefted a twenty-five bag of flour into my grocery cart. 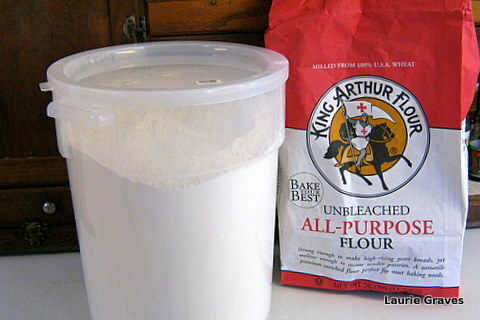 A woman—someone I didn’t even know—did a double take when she saw the big bag of flour in my cart. “That’s one big bag of flour,” she said. “I make bread,” I replied. “Well, good for you,” she said amiably and continued on her way. A little while latter, I stopped and chatted with my friend Mary Jane, but she didn’t say a word about the flour. She knows I make bread. No explanation was necessary. Next Sunday when I call Dee, I will tell her about the various encounters I had on Monday. I will tell her I am not offended by the nosiness of small-town shoppers. On the contrary, it adds texture to life, giving a personal touch to that most mundane of experiences—grocery shopping. Sometimes, even the cashiers get in on the act when they see something unfamiliar and potentially tasty among my groceries. I am always happy to talk about food, and I gladly tell them about the delicious item in question. I view these comments as one of the benefits of living in a small town, where a trip to the grocery store almost always guarantees some kind of personal interaction. It makes me feel folded into the community. It makes me feel that I matter as an individual. In a world where the human population is climbing toward nine billion, this is no small thing.